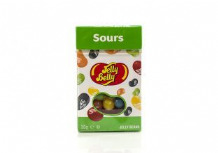 Caution: Contains weird & wild Jelly Belly flavours. From the Harry Potter Film Series. 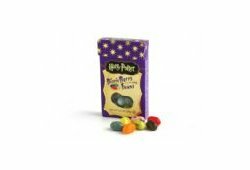 The flavours are very realistic - you have bean warned! banana, black pepper, blueberry, booger, candy floss, cherry, cinnamon, dirt, earthworm, earwax, grass, green apple, marshmallow, rotten egg, sausage, lemon, soap, tutti-fruitti, vomit, watermelon. Ingredients: sugar, glucose syrup, modified cornstarch, peach puree concentrate, natural and artificial flavourings, strawberry juice concentrate, colours: E100, E102, E110, E129, E132, E133, E150d, E171; salt, pear juice concentrate, acidity regulators E330, E331; glazing agents: E901, E903, E904; coconut, cocoa powder, tapioca dextrin. may contain nuts.